Just yesterday, the GOP led House, after failing to do so last week, renewed three provisions of the USA PATRIOT Act concerning government agents snooping private business records, so-called “lone wolf” individuals suspected of being a terrorist, and the roving wiretap provision. Despite glaring civil liberties concerns, the bill was rushed through with virtually no debate and no hearings. Now it’s time to name names. But rather than name the names of those who betrayed the Constitution, instead I decided to name the names of those 117 Democrats and 27 Republicans who actually upheld their oath and voted against extending these provisions of the so-called Patriot Act. 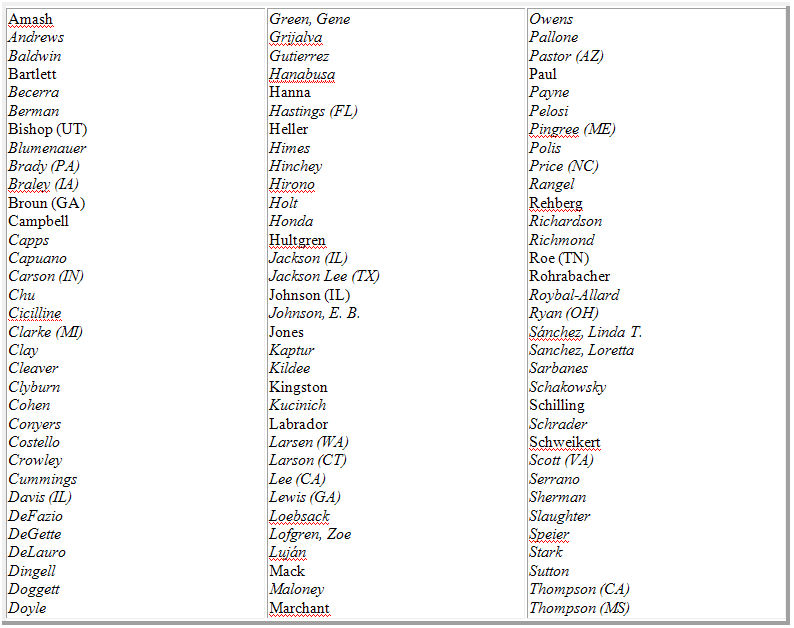 If you do not find your congressperson on this list s/he either voted in favor of the extension or didn’t vote at all. To see the entire roll call, click here. I notice that the two senate republicans to vote for liberty are also two tea-party republicans, right? but the Tea Party is just code for “Secret Racists.” You gotta get into the NorthEastern “no I’m not Libertarian Party proper, but, really I am” mentality of this blog to get the slow death here. Believe me, if you knew anything about the 2008 conduct here by the contributors, then you’re in for some good stuff late this year and into 2012. BOYCOTT the next Presidential Election! Enjoy what’s left of your freedom while it lasts, Americans! We were duped in the last presidential election, into thinking we actually had a choice. In retrospect, we can see that actually we had no choice. Obama’s “policies” have been substantially the same as those of his predecessor, despite his phony talk of change. Nowadays, the only choice in an election in the US is whether to vote for the stooge of the rich and powerful with a D behind his name, or the stooge of the same rich and powerful people who has an R behind his name. How can we break the grip of these unscrupulous (putting it mildly)self-serving betrayers of the American people, on the US Government? I propose boycotting the next presidential election as a start. That will make it clear to these people that they are not deceiving most of us, and it will deprive them of being able to claim a popular mandate.